Our favorite weekend of the season is upon us! 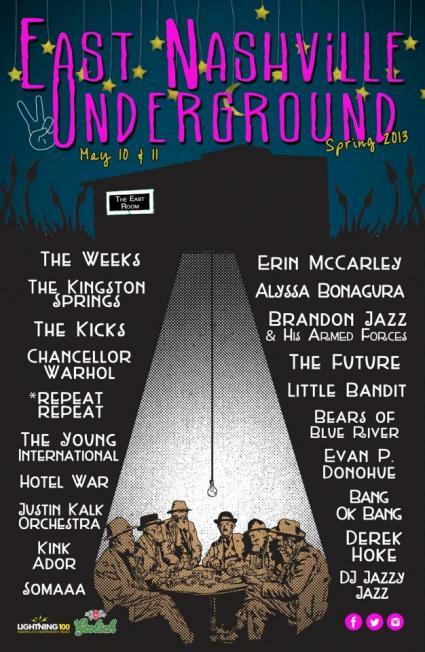 Starting tonight at 9 pm, East Nashville Underground's spring lineup hits the East Room for their last festival weekend in the two-story venue on Gallatin Road. Tonight starts strong with the Kicks and the Weeks headlining, and the weekend has no intention of slowing down, with Erin McCarley and Alyssa Bonagura headlining the Saturday day show and the Kingston Springs and Chancellor Warhol taking the big spots for the night show. In the past, we've spared no expense fawning over the Corders and their independent festival that started in a basement, so there's no doubt that you're in for a wild ride this weekend. For the price of a wristband, you get two nights (and one day!) of rad music, free drinks, and a $1 candy buffet (where you'll find me, hi). If you haven't pre-ordered your day pass or wristband, be sure to show up early to get in, and we can't wait to see all of your sweaty, happy faces tonight at the East Room!